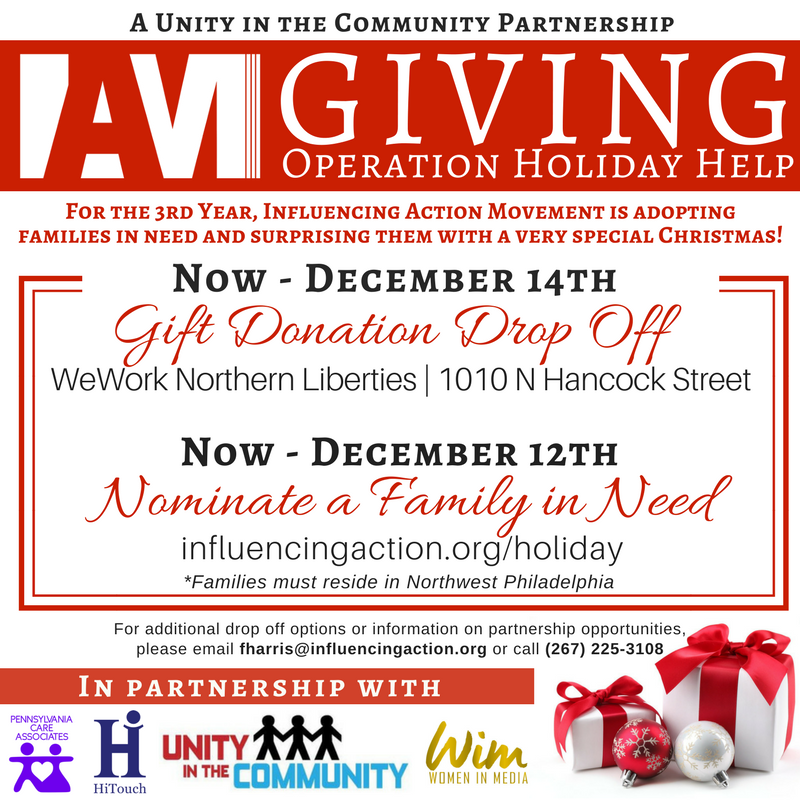 For the third year in a row, IAM has joined Unity in the Community to help expand their “Operation Holiday Help” initiative to Northwest Philadelphia! Unity in the Community’s annual “Operation Holiday Help” provides local less fortunate families in Philadelphia with a generous donation of new toys and gifts. The new toys and holiday presents are delivered to the unexpecting homes of the families on Christmas Eve by Unity in the Community and their partners. Past participants include Mayor Nutter, State Representative Jordan Harris, Councilman Kenyatta Johnson, community organizations The Rainbow Coalition, Nice Guys, Don’t Shoot I Want a Future, Power 99FM’s DJ Diamond Kuts and Santa Clause. Families facing financial difficulties are identified and nominated by local members of the community. IAM is excited to again join this wonderful initiative as a Northwest partner organization! IAM needs your help to make this year’s Operation Holiday Help a success. Donate a gift! You can drop off gift donations at WeWork Northern Liberties, 1010 N. Hancock Street any time until Thursday, December 14. All gifts are welcome — we have families with babies, toddlers, youth, teens, single mothers, and fathers! If you are unable to drop gifts at this location, give us a call at (267) 225-3108. If you prefer to make a monetary donation, click here. All monetary donations will be used to purchase additional gifts for the families and transport the gifts. Nominate a family! IAM is looking for families who reside in the Northwest community (Germantown, Mt. Airy, West Oak Lane, East Oak Lane) that have experienced a hardship in the last year and need our help to make their holidays special. Nominations will be accepted online until December 12th. Click here to nominate a family.